Bio-Rad Laboratories, Inc., a global leader of life science research and clinical diagnostic products, today announced the launch of its isotype-specific secondary antibodies. Scientists at Harvard Medical School and the Dana-Farber Cancer Institute have developed a method that exploits the multitargeted nature of a chemical inhibitor to pinpoint vulnerabilities within cancer cells. Syngene, a world-leading manufacturer of image analysis solutions, today announced its G:BOX Chemi XX6 multi-application imager is being utilized by scientists at a major London university to speed up analysis of proteins, DNA and cells associated with breast and a range of other cancer types. An interview with Dr. Karolina Szczesna, discussing the tell-tale signs of a good antibody and how Proteintech are working to improve experimental results for scientists. An interview with Ramya Prabakaran & Melody Chang from GenScript, discussing the development of automated systems that improve outcomes for western blotting. Inflammatory bowel disease is a set of painful conditions that can cause severe diarrhea and fatigue. Treatments can include medications and surgery. But now researchers report that a simple dietary intervention could mitigate colonic inflammation and improve gut health. We are Cyanagen, an Italian company, here at Analytica in hall A3 booth 416. We produce reagents for molecular biology, mainly ECL substrates for Western blot analyzers and fluorescent reagents for several applications. Researchers at Okayama University describe in the journal Scientific Reports the role of an extracellular protein, versican, in regulating tumor growth and providing a newly formed network of blood vessels to further nourish the tumor. Low-level laser therapy has been shown by recent studies to be a non-invasive and effective alternative for treating neuropathic pain, a chronic condition caused by nerve damage, spinal cord injury or diseases such as diabetes. Learning and memory are crucial aspects of everyday life. When we learn, our neurons use chemical and molecular signals to change their shapes and strengthen connections between neurons, a process known as synaptic plasticity. AMSBIO has introduced new cell lines and controls for Programmed Cell Death Protein 1 (PD-1) research, and to test inhibitors of the PD-1 / PD-L1 pathway. Sarcopenia is the aging-related loss of skeletal muscle mass and strength. Preventing sarcopenia is important for maintaining a high quality of life (QOL) in the aged population. The nano-experts from the Center for Applied Nanotechnology (CAN) GmbH expand their product portfolio by CANdots® Series G - His Detect, which is a ready-to-use reagent for the detection of poly-histidine tagged proteins in Blot assays. It is easy to handle, highly sensitive as well as time saving compared to standard methods available on the market, e.g. ECL. Available from AMSBIO -Lipidure®-Coat low adhesion plates and dishes are shown in cited research to be one of the most effective tools for state-of-the-art 3D spheroid cell culture. These new plates and dishes are available in 384-well format optimised for drug screening or other high throughput applications. An international team of scientists led by Fred Hutchinson Cancer Research Center cancer proteomics expert Amanda Paulovich, M.D., has demonstrated the feasibility of large-scale, standardized protein measurements, which are necessary for validation of disease biomarkers and drug targets. Administration of the active compound tetrahydroxystilbene glucoside (TSG) derived from the Chinese herbal medicine Polygonum multiflorum Thunb, reversed both overexpression of α-synuclein, a small protein found in the brain, and its accumulation using a mouse model of Alzheimer's disease. Today, LI-COR Biosciences continues to demonstrate its position as a leader in laboratory instrument systems as it announces the launch of the C-DiGit Blot Scanner. GeneTex, a leading manufacturer of antibodies and antibody-related reagents, is set to launch a new antibody against phosphorylated Histone H3. GeneTex, Inc., a leading manufacturer of antibodies, has announced that they will be launching a new antibody against HIF1a (hypoxia-inducible factor 1alpha). 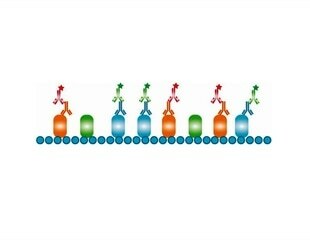 Researchers for the first time have shown that members of a family of enzymes known as cathepsins - which are implicated in many disease processes - may attack one another instead of the bodily proteins they normally degrade. Dubbed "cathepsin cannibalism," the phenomenon may help explain problems with drugs that have been developed to inhibit the effects of these powerful proteases.